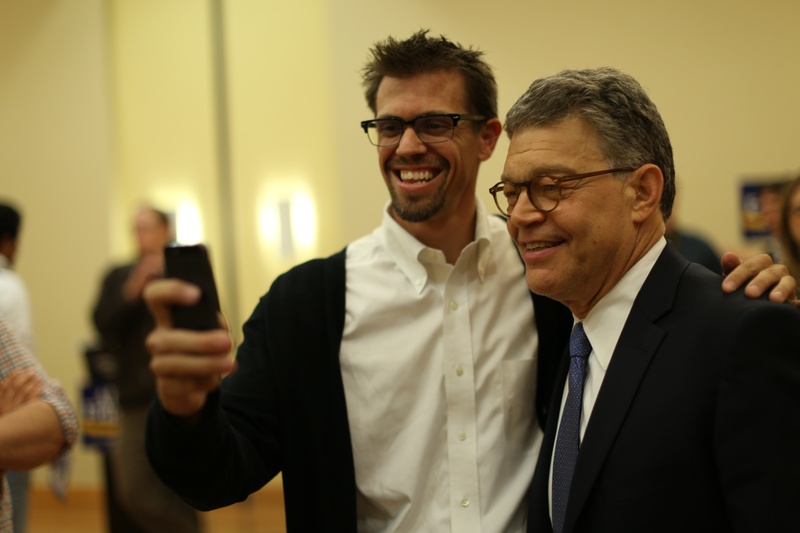 Senator Al Franken takes a selfie with a supporter on Monday afternoon. Photo by Maddie Malat. In a room teeming with student supporters, and a plethora of blue and yellow campaign signs, Sen. Al Franken took to the stage Monday afternoon to address the students of Concordia. In a voter registration and campaign event with other democrats – United States Rep. Colin Peterson, Minnesota House Rep. Ben Lien, Minnesota State Sen. Kent Eken and Moorhead Mayor Del Rae Williams – Franken spoke about issues present in his current re-election campaign, like the Farm Bill and renewable energy. But Franken also focused on issues prevalent to college students. In his speech, Franken spoke about the cost of college and net neutrality. With the rising cost of college, Franken said he wants students to know the true cost of college before they think about applying. He is also looking into ways of reducing the debt incurred by students when they take out loans for college. Franken said he is an advocate of open-source textbooks on college campuses. He said having more resources like a texts available for all students can help to keep costs down for each individual. Junior Alex Gray attended the rally Monday, but it was his second time seeing Franken speak. Gray saw Franken speak at Concordia two years ago, and he said the wow factor of seeing Franken had worn off the second time around. At one point during his speech, Franken asked the crowd if they were tired of standing. He then went on to say he would sit on the ground with everyone if they wanted to. No one sat on the ground. Franken laughed off the attempt. Gray said he was not surprised by Franken’s gesture. Franken said he hoped the event encouraged students to participate in his campaign and to vote in general. “I hope people came out to hear why voting matters,” Franken said. Gray said even though attending the rally won’t change how he votes in November, he was still able to get something out of the event. Franken knows his re-election is all but guaranteed. I'm Sean Plemmons, the Editor-in-Chief for the 2014-2015 school year and a member of the class of 2015 at Concordia. I am a Multimedia Journalism and Political Science major with an English Writing minor. If you have any questions, don't hesitate to contact me at concord@cord.edu. Journalism is part of my life, and everyone else's. Let's tell stories the right way.